These mags are DP reliable, of course, and have an easy-to-remove CNC machined aircraft aluminum basepad, not plastic. We built them to withstand a nuclear blast (although we haven't tested that yet). 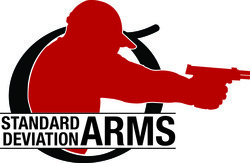 The Competition Standard Basepad's wedge shape extends as long as possible for positive seating, but still fits both IDPA and USPSA boxes. There are finger grooves on the sides of the base just in case you need to pull a stuck mag out fast.